The chocolate colored furniture is sure to keep the master bedroom looking stylish! 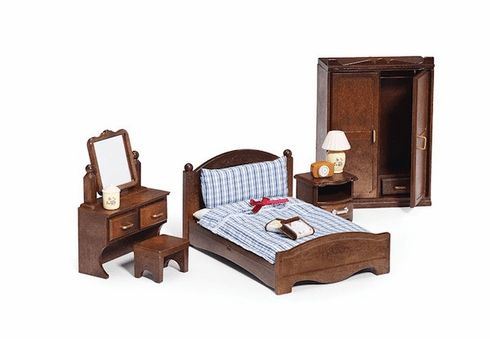 Includes be with matching bed sheet and pillow, armoire with drawer, vanity/dresser with mirror and 2 drawers, bench, night stand with drawer, lamp cosmetic jar, alarm clock and 2 books. Mix and match with other Calico Critter figures and furniture. May be used with a house or alone. Figures sold separately.